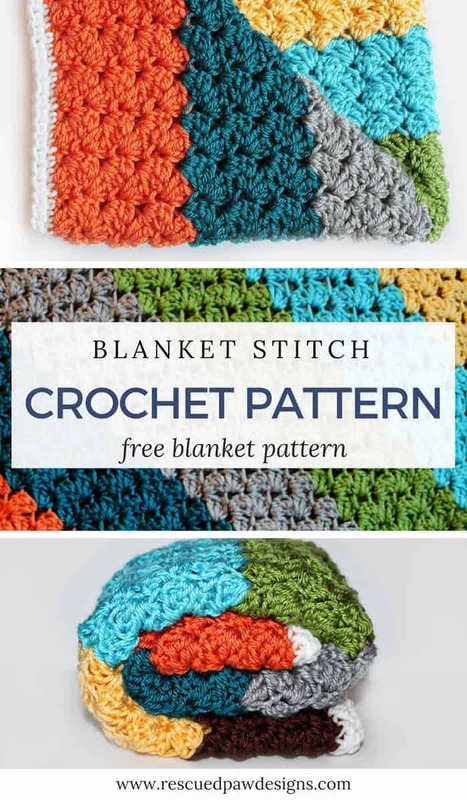 Learn how to crochet the blanket stitch today with this free crochet tutorial and blanket pattern! Quick to learn & Works up fast! 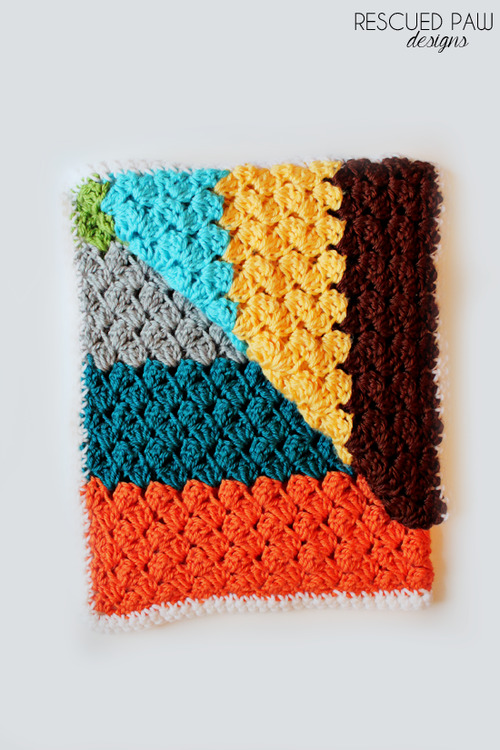 The blanket stitch is an easy crochet stitch to learn. This stitch makes it easy to crochet a baby blanket up in no time at all and it creates a beautiful textured stitch that is unique to other stitches out there. 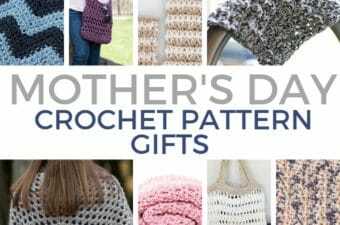 Ready to learn how to crochet the blanket stitch? Read on down for the easy step by step crochet pattern! 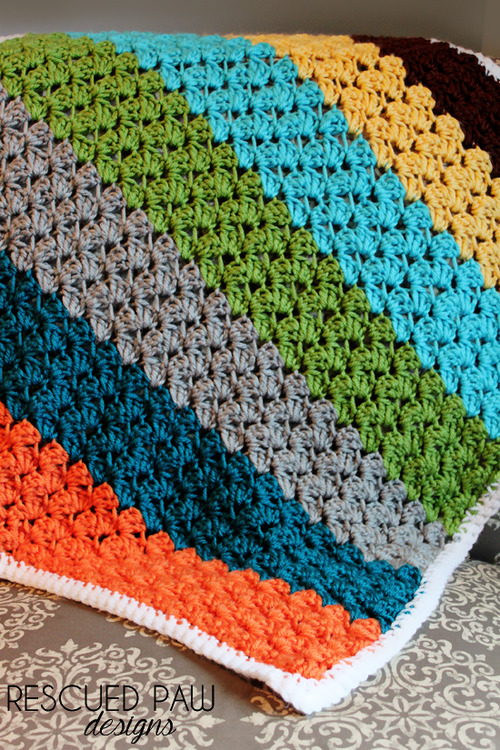 This blanket is designed to be a small baby blanket or lap throw which makes it the perfect go to project to use up extra yarn. I had a lot of leftover yarn (which I am willing to be you do to!) from past projects so I decided to use all different brands to create a fun unique baby blanket. For this blanket I mostly used Red Heart Soft Yarn. If you wanted to get a similar look I’d suggest this yarn. It has beautiful almost shiny look to it which makes the blanket look even better in my opinon. If you don’t have that yarn handy any worsted weight yarn such as Lion Brand Vanna’s Choice would work just as well. The colors used also lends itself to being unisex and is perfect to use as a baby shower gift! 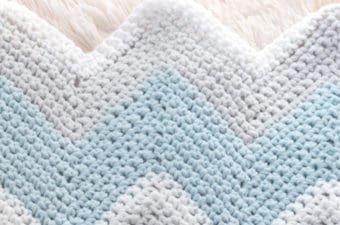 If you are ready to make this baby blanket read on down for the full, FREE pattern using the crochet blanket stitch! 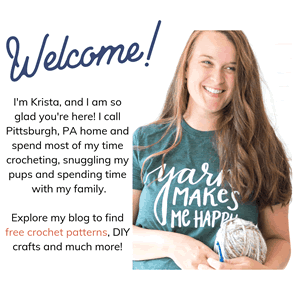 I hope you enjoy my free blanket stitch tutorial and..
Red Heart Soft Yarn in Light Gray Heather, Teal, Tangerine, Turquoise, Chocolate & Guacamole and Caron Simply Soft in Sunshine. To change the size chain a multiple of 3 to desired length and continue with written pattern. You can do one solid color instead of changing colors if you prefer. 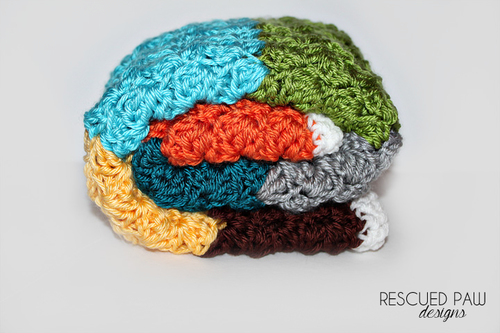 How to change colors in crochet tutorial can be found here. Row 1: Make 2 Double Crochets in 3rd Chain from Hook, Skip 2 Chains, Make 1 Single Crochet & 2 Double Crochets in the next Chain, *Skip 2 Chains, 1 Single Crochet, 2 Double Crochets in same Chain, Repeat from * to the end of the row. Make sure to end with 1 Single Crochet in last chain, turn. Row 2: Chain 2, Make 2 Double Crochets in first Single Crochet (from previous row), * Skip next 2 Double Crochets, Make 1 Single Crochet & 2 Double Crochets in next Single Crochet, Repeat from * until end of row. End with 1 Single Crochet in last chain, turn. Row 2 -77: Repeat Row 2. Fasten off and weave in loose ends with yarn needle. Border: Attach color you have chosen for the border in a corner by doing *3 single crochets, continue along edge evenly single crocheting until you reached the next corner. Repeat * until you reach the starting corner. It i is very improtant to make sure to do 3 Single Crochets in every corner and attach last Single Crochet of border with a slip stitch. You are done with the blanket stitch tutorial! My final blanket measured approximately 23 x 27 inches. 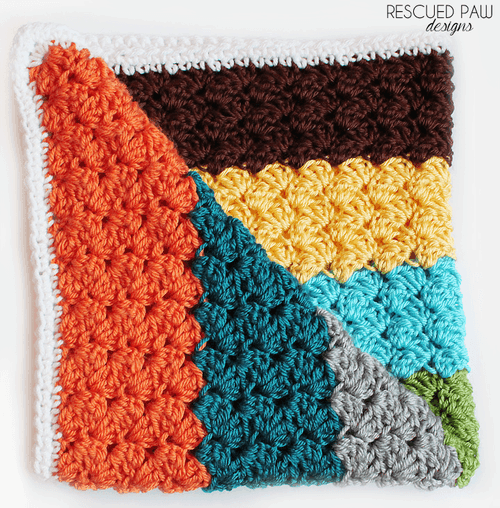 I hope you enjoy making this blanket stitch blanket crochet pattern as much as I did! Don’t forget when you are finished making your blankets to share them with me on Instagram with the hashtag #RescuedPawDesigns. If you have any questions, feel free to ask! I am more than happy to assist in any way possible. Thankyou so much to share this Blanket, is beautiful! Is very usefull way to use all that yarn that i just put away. You could easily adjust the width and length if you choose. Just make sure to chain a multiple of 3 to start. How many rows did you do for each color? 11? Just making sure. Thank you!! This blanket is beautiful and perfect!! Hi Krista, About how many yards of yarn would this be in total? I am thinking of making it using just 2 colours and not sure how much I will need. Happy new year from Australia! Did you do 4 skeins of each color? I’m going to try it in super bulky with larger hook so I’m trying to gauge how many skiens.. I really love this pattern. Easy to follow. I was looking for an easy pattern to take on vacation & I think I have finally found it. Thanks for sharing. I am trying to print out the pattern for my 89 yr old mother who loves to crochet. 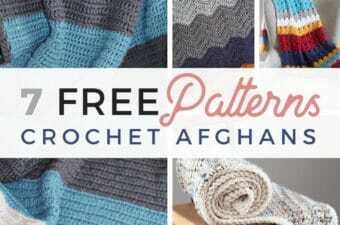 I thought this would be simple to sign up for free patterns. I get nothing. You can use printfriendly.com to print my patterns. How many chains to make a full size blanket?